When Android 8.0 lands this fall, two things will be certain: It’ll have a sweets-inspired name beginning with the letter O, and the notification system will get another series of changes. The steady stream of beeps and buzzes that we get on our phones is a never-ending work in progress, and Google is constantly trying to walk the line between indispensable and irritating as it works to refine its system of alerts. Nougat brought some much-needed features to Android’s notifications, adding extremely useful changes to the way we view and interact with them. But while many apps have taken full advantage of the latest features, navigating the notification shade on a Nougat phone can still be a hit-or-miss affair. With a few tweaks, however, Google can truly revolutionize notifications in Android 8, bringing the same level of control we enjoy with the interface to the alerts we receive throughout the day. 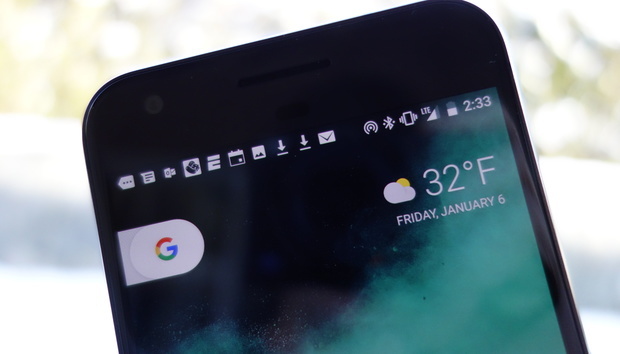 The tiny notification icons in the status bar are one of the things that makes Android unique, and they can be tremendously useful as visual reminders of things that need immediate action. But they can also be a terrible nuisance, cluttering the tiny space above our home screens and apps, and commanding equal attention for urgent and unimportant matters alike. The status bar gets crowded enough without displaying duplicate icons for the same app. The System UI Tuner already allows you to turn off the icons on the right side of the status bar (Bluetooth, Wi-Fi, etc. ), but the left side can be far more distracting. While Google is unlikely to ever eliminate them completely (and there’s no reason it should), status bar notifications needn’t be such an all-or-nothing affair. Just like it does with the lock screen, Google could provide an option for notifications to appear in the status bar, so you could designate only the most important ones to occupy such prime real estate. But even if Google never lets us turn them off, there should never be duplicate icons in the status bar. Whether it’s a bug or a feature, they’re pointless and distracting, and if nothing else, Google should make it a point in Android O to make sure only one icon per app appears, no matter how many notifications pile up. How it could work: When you tap on an app in the Notifications settings, add a new tab: In the status bar. Then you can choose from the same three options: Show all notification content, hide sensitive notification content, and don’t show notifications at all. The thing about notifications is that their value begins fading almost immediately. If they sit for more than a few hours, they can most likely be dismissed and ignored, yet there’s no way to get rid of them unless you recognize their existence in some way. It would be nice if you could tell Android to automatically delete notifications for day-old sports scores. It’s in these instances when automatic expirations would be useful. For example, you could set calendar entries to disappear a few hours after the event has ended, or sports scores to clear after a day. It would keep the status bar and shade neat and tidy, while allowing timely and pertinent notifications to rise to prominence. How it could work: Inside an app’s notification settings, there could be a new Notifications history option. Inside you could set when you want notifications to disappear from a time picker. Nougat’s introduction of bundling was an effort to bring a measure of order to the notification shade, but there’s a lot more Android could do to rein in wayward alerts. Too often the status bar and shade become bogged down with out-of-order alerts, and there’s no way to fix them, save to clear them all and start over. Once an app is launched, its corresponding notification should instantly disappear. A “group by app” option would go a long way toward bringing some order to chaotic notification shades, letting you quickly see which apps require the most attention and catch up on outdated alerts. And by making it a toggle in Settings, we wouldn’t even have to wait for developers to get around to adding it. Also, notifications should disappear once the app is launched, whether or not you’ve acted upon it. And here’s one Google really needs to take from iOS: unread badges on app icons. Right now the only way to get them is to install a third-party launcher or select custom apps, and it’s crazy that Google hasn’t yet built the option into Android. The glanceability factor far exceeds that of notifications, and badges actually encourage you to interact with the app. And since using them is an app-by-app decision independent of notification banners, they could also cut down on the number of alerts we receive. How it could work: In the main notifications settings window, an option to either group chronologically or by app could be added. For badges, it would be a per-app settings, with an option to add a badge or turn off peek notifications. Most Android users probably have at least two devices, whether it’s a tablet or another phone. Each has its own set of notifications to clear, whether or not they were already addressed on another device. So if you just plowed through a mountain of email in your inbox on your Pixel phone, those mail notifications will persist on your Pixel C tablet, even though your Gmail account has dutifully synced the messages. Status bars would be easier to manage if notifications synced across all of our devices. Our Google accounts already handle everything from backups to bookmarks, and it would be great if they could sync notification status across our devices, too. And while we’re talking about keeping things in sync, lock screen notifications should be reserved for only those alerts that arrived since the last time you locked your phone. Keeping old ones visible defeats the purpose of having them appear on the lock screen in the first place. How it could work: A toggle in Google Drive or Settings could include an option: Sync notifications with a simple on or off switch. Along with the dozens of alerts it needs to handle every day, the notification shade also serves triple duty as a playback controller and settings screen. And on larger phones, it can be a nuisance to stretch your finger all the way to the top of the phone just to pause the song playing in your headphones. Google Now would be a great place to put the settings and now playing screens. But the coveted space to the left of the home screen could be a perfect placement for persistent notifications. Of course, it’s currently occupied by Google Now, but since Google Assistant is likely to be deeply integrated into the next version of Android, the smart card system could be obsolete before long. But even if it remains, now playing and settings cards could easily be incorporated into the existing design, making them easier to access and uncluttering the space above the notification shade. How it could work: Google could simply move the quick settings and the now playing screen to the bottom of the left-most screen, not unlike what Apple does with the Control Center. And even if Google doesn’t want to open full Google Now access to third-party launchers, it could still provide those two cards.